India conducted its first nuclear detonation, described by India as a "peaceful nuclear explosion," on 18 May 1974. This test, which may have only been partially successful, demonstrated a claimed yield of 12 kt. The device was emplaced in a vertical shaft and detonated at a depth of 107 meters. It is reported that the American intelligence community estimated that the actual yield was in the range of 4 to 6 kilotons. 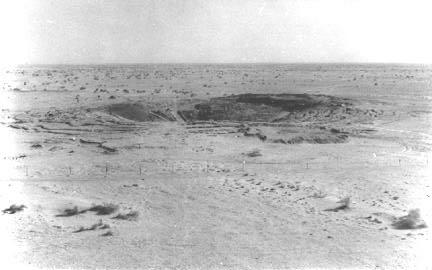 The test produced a crater with a radius variously reported at between 47 and 75 meters, and a depth of about 10 meters. High-resolution commercial satellite imagery discloses that the subsidence area proper has a radius of about 60 meters, and is surrounded by a distinctive heart-shaped perimeter with a radius of roughly 80 meters. 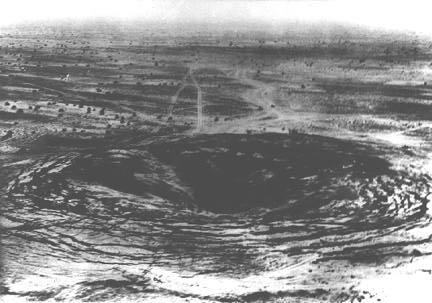 First underground nuclear explosion at Pokhran in Rajasthan on May 18, 1974. Photo shows a view of the creater formed after the explosion.